A wide selection of Super Mario Bros. themed games submitted from huge fans of Mario between 2001 and 2006. Thus, ensuring their efforts won’t be lost amidst the intraweb abyss. The fan made games (the downloadable and playable type) were submitted to the old Super Mario Portal formerly marioportal.com. The list is sorted by author name—created with software called Game Maker although this doesn’t apply to all of them. The creator made the games a long time ago so it’s no wonder to hear some of them are now professionals in videogames, or still on video, graphic design related courses. The games are not commercial, not for sale, not official, and most importantly the sprites, sounds, etc used within them are strictly own by the owners (as detailed in each individual game). Other associated names aside from “Super Mario” are © Nintendo and other respective owners. Winzip/Winrar is required to unzip/open these games which were made by fans, for fans like them. 8-bit Waluigi gets a training... A very hard training. He must do as much perfect uppercuts as he can at a moving target! To uppercut, tab space! If the target gets out of jour sight jou lose!!! GOOD LUCK! NOTE: This is the Demo version of Super Mario Land X. Press F1 during the game for controls! Try your luck on the slots in the best Casino in Delfino, just click on each slot and try to get three of the same icon in a row! Press the thwomp to try again. Okay, you start as the red virus inside a puzzle of Dr. Mario's megavitamins. Your mission is to escape the bottle by getting to your virus buddies. You can't walk on the pills just jump/float to them. Welcome back to the bottle. Dr. Mario has created a new Virus destroying weapon called the NegaVitamin. Your mission is to climb from pill to pill and reach your Virus buddies. Play as enemies from different games and try to get through all the levels. There are different commands for different enemies, all of which are explained in the game! Chargin' Chuck and Big Boo, tired of being constantly defeated by Mario, have kidnapped the plumber himself!! Now Luigi and Peach must rescue him!! Run, jump, and dodge through 5 Mario themed levels and fight the easy Koopa at the end to save Princess peach! Featuring a save/load capability. A very simple Fan game where you have to click either of the two fast-moving bouncy Mario's which you see on the screen, each time you click on him he will give you one point and will re-appear elsewhere on the screen. Well before I get emails from concerned parents, SMP in no way endorse your children playing in the road to see how long they can survive for to gain points. Guide Mario through the road and dodge as much oncoming traffic as possible, the longer you survive the higher your score! Controls are the arrow keys! Brilliant game, has a great feel to it, and a good ease of control, a classic fan-game masterpiece - thanks for submitting this. Controls: Arrow keys to move, CTRL to Jump. IN THIS GAME, THERE ARE 7 LEVELS. PRESS CONTROL TO START THE MUSIC AND SHOW THE GAME INFO, AND THE ARROW KEYS ARE TO MOVE. Super Mario World style graphics, but a game with a difference, you are the goomba, running jumping dodging etc, and there are dumb Mario's and Luigis etc patrolling, Fire Flowers are enemies etc - Nice twist - give it a go. This is three games in one! The three games are called: Bombs away, Mazza Dodge and Mario Shootout, the theme tunes are really cool and there's a game for everyone here. Press enter on the first screen to start. Bombs away:- Left and right arrow to move side to side, F to throw bricks. 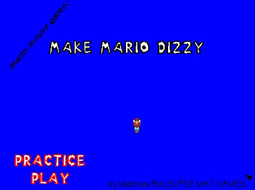 Mazza dodge: You control the row of Marios at the bottom, move them left and right to dodge the Mushrooms being thrown by Evil Mario, the longer you survive the higher your score. Mario Shoot Out: Avoid the cloned Mario's by moving around with the arrow keys, press the spacebar to Fire mushrooms and eliminate the cloned Mario's to gain score. Mario can only shoot upwards in this version. 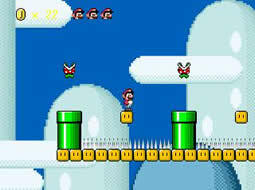 228 Mario's is a compilation of Mini-Games, consisting of: Bombs away, Dodge Mazza, Shoot-out and The War, there is also the option to clear the high score table on each game. Press enter on the first screen to start. Mario Shoot Out: Avoid the cloned Mario's by moving around with the arrow keys, press the spacebar to Fire mushrooms and eliminate the cloned Mario's to gain score. In the 228 version Mario can shoot in all different directions. Mario War: You play as Luigi, use the up and down arrows to move and the spacebar to fire rockets at the Mario clones. I know what you're thinking. Play as Mario and defeat Bowser. Haha! Not this time! This you play as that ugly King among Koopas to see how many times you can shoot Mario with Bullet Bills! Nowhere to run this time, Mario!!! Control details in the zip file. Bowsers Stadium, in this game you play as Mario and can run back and forth left and right and fire missiles in three different directions, using Space, Enter and Control keys and the arrow keys! Dr. Mario has shrunk himself, so he may fight the viruses directly. He must now fight his way through an army of viruses! You play as the flying Goomba from SMB3, try to fly away from the balls before they hit you out the air and crush you, the longer your alive for the more points you acquire. Controls are the arrow keys! and Spacebar will drop the balls again. You play as giga bowser on the rampage, you can either trample on tanks (but this gets you no points) or throw fireballs at them using the spacebar. The sequel to the goombas original adventure, this game is just as crazy, just as illiterate and just as fun as the original, you play as a goomba, in his biggest and best adventure yet! Clicking on certain characters/items will get you a certain amount of points, stars are worth one hundred points and the controls are just move around with the mouse and click using the left mouse button! Ah, Luigi the treasure thief, probably my hardest game yet! An action packed adventure featuring battles vs. the most intelligent enemies that Mario has come up against yet, with awesome scenery (as you can see above) and weapons such as a gun for example, Spacebar to fire! have fun! Bowser and King Boo have formed an alliance and have kidnapped the Princess. They have taken her to Boo Mansion as Bowser's Castle was destroyed. Mario must travel there cleansing the whole area of ghosts. See the readme.txt file provided by the author for control instructions! Use Spacebar to fire missiles forward, enter to fire missiles backwards, L to fire left and R to fire right. Remember Mario's Assault? Picture that with twice (or sometimes more than twice) the action, and twice as difficult, and you have the super edition of Mario's assault, with the same controls as it's predecessor! As you race along the highway you must avoid Boo's, Koopas, and eventually bowser, collecting pasta will increase your petrol level, the controls are the arrow keys, and you start with three lives! Get racing! You play as Mariofan9 speeding down a busy highway, you have to pick up the jewels and other valuable stuff along the way to get a higher score, but you have to also dodge the hazards in the road! good luck! Mario enters no mans land, there is no hope here, only flames, and the strongest enemies known to the Koopa Armies, in this auto scrolling adventure you have to dodge all the oncoming enemies as best you can, the longer you live the higher your score! This is ping pong as you've never seen it, and more difficult than you've played it too I'll bet, you play as both Mario and Luigi who are on separate sides of the screen, you use the arrow keys to move up and down, try to return the ball to each other! Peach, its time for you to shine. Toad, Mario and Luigi have been kidnapped. You got to find them, good luck! The controls are Jump/Climb (Up Arrow), Walk left (Left arrow), Walk right (Right arrow). Mario runs frantically from side to side along the yellow blocks at the bottom, you play as Bowser, the only control is the spacebar, try and time bowsers descent so that he lands on Mario and crushes him! Kinda similar to the above Mario's Adventure, but this time your not Mario! The controls are, up to jump, and left and right for.. left and right! Luigi plays kind of like he does in SMB2, can jump very high and hovers. You play as Luigi, after being killed by the Koopa's his soul must fly to heaven, but his troubles aren't over just yet, there are lots of mean enemies on the way up, shoot them using the space bar. Bowser is very hungry because he is stranded on a small island. he sees stars everywhere so he decides to eat them. Bowser thinks they taste like pie. Geno sees him and says "don't eat my friends." Now you must control Bowser and eat as many stars as you can. if Geno gets you, you die therefore crashing the game. you have one minute to eat. A great looking SMW-type game for you to enjoy. Ouch... those spikes look nasty. Are you mad at one of your Mario games because an enemy keeps killing you, THAN GET REVENGE! To ease out the stress of being killed all the time, take a rifle, and blast the enemies through there heads! That should help ease your agony. Pac-Man with Mario style, eat as many mushrooms as you can, each one is worth points, the controls are the arrow keys, you can of course go up, down, left and right - avoid the patrolling guards as you go. Tatanga's back in an all new adventure! He got really angry when Mario beat him up in Super Mario Land, and want's revenge! So Tatanga called Wario (in 2 player mode). Then Mario found out about it, so he called Luigi to help! So they got in a big fight! You start with one Kirby, but then you bump into his clone when you pickup the first diamond, from this point forward you play as two characters, one being a clone of the other, controls are the arrow keys! The aim is to get more diamonds! You play as Luigi in this game, your trapped in a room with boulders being dropped through the ceiling, avoid them for as long as you can! More and more boulders will come out the longer you live to make it harder, controls are the arrow keys, with up arrow being to jump. In this SMB3 Battle-mode style game you have to avoid the enemies which come out of the different pipes, the longer you avoid them (by jumping and using the arrows keys) the more points you get, whoever survives the longest wins! To complete this game you must guide Mario-90 to each of the diamonds on the level, when all the diamonds are collected you have completed the level. Diamonds can be found inside places aswell as outside them and the controls are the arrow keys! Guide Mario through this dangerous maze, their are Crying Bowsers at every turn, you have to time it so when Bowser goes one way you go another, controls are the arrow keys! Good luck! The first new Marioportal submission since 2004! This excellent game is worth having a go at. In this game the level automatically scrolls along for you, all you have to do it crouch or jump, to avoid the blocks, you get five lives and the longer you live for the more points you get! Sound easy? You'll be surprised how difficult it is. The Mushroom Kingdom is in big danger! There are coming to much evil boombooms! Jou, a brave hammer brother wants to do something about that. So jou grab jour weapons and jou go to dark land! Don't give the boombooms a chance to become a team of hundred. SPACE TO DROP BOBOMBS! A staff mini game in which you play as Chris by Mariofan9. Chris of Marioportal has a problem: Bowser has cloned him billion zillion times!! Now chris must defeat them with his ULTRA ROCKETS! Jou can move up and down with the arrow keys! Space to shoot an Ultra rocket. Jou can only shoot another rocket if jour first rocket is out of sight. ESCAPE to start! READY.... SET....... GOOO!!! The aim of this game is to click on as many stars to get the maximum score possible, but if you click on a fish by accident (it's harder than you'd think because the stars move so quickly) then thats it! your dead! You control this game using just the mouse! A staff mini game in which you play as DarkAngel by Mariofan9. The Yellow Boo is out to get Dark Angel and he wont stop til he gets him, use the arrow keys to get away and collect as many of the fallen Staff cards as you can, the more you get the higher your score. A two player game! the controls etc are explained within the game, each player controls a toad who is trying to catch the Dizzy dial that appears at random intervals, first one to get it wins! Dracon is on his special POWER BLOCK training. He must do the right pose when he touches a POWER BLOCK. CONTROLS: SPACE= SHELL POSE, NO KEY= STAND POSE If the block comes from above use the shell pose! Use the stand pose if it comes from the right! Press escape to start. F4 to use fullscreen mode. Like Dr. Mario, but Mario has a more direct role here! He has to catch 100 vitamins before the time runs out, and dodge the viruses when he can, cool theme tune, controls are the arrow keys. Different coloured vitamins are worth a different amount of points. As Dylan unsuspectingly strolls through the dodgy blue liney place, many projectiles are hurled at him from the skies by an unknown enemy, additional to this, spike strips float toward him, click on the projectiles before they get Dylan! the longer you live the more points you get, if you get hit its game over! Avoid the Blarggs and don't fall into the lava, keep going to see if you can escape from Bowser's Stomach, Mariofan9 got the idea for this game from an entry in the Mailbag. A staff mini game in which you play as Facechild by Mariofan9. Facechild is looking for his coins but some enemy's have shooted many sorts of torpedoes to stop him! EVADE THE ROCKETS AND GET JOUR COINS! USE THE ARROW KEYS TO MOVE LEFT AND RIGHT! A staff mini game in which you play as Joker by Mariofan9. Joker has got a LOT of mail lately! He can only receive email by throwing his receive ball! But there are doubleposts and spam with it! Be sure that jou DON'T throw jour ball at spam and doubleposts! Prepare to be destroyed (every time) by Green Boo as you fail to Volley the Buzzy Beetle back to him! Controlled by the arrow keys, help King Terask reach his Sword without being destroyed by the Pandorites. Each time you make it to the sword you score a point. You play as Bowser, move the hand round with the mouse, and press the spacebar to drop kinklinks, stop all the Smithy clones from escaping from Bowsers keep. Lord_Bowser is on a well deserved vacation in the mountains! BUT..... He is under attack. The enemy's attack him when he has no weapons with him! Cowards! They are shooting bullets at Lord_Bowser. But Lord_Bowser has many soldiers. You play as Luigi in this unique Fan Game, you have to avoid all the different coloured Big Boo's for as long as you can, but if the Boo's get you, you lose! Use the Arrow keys to move around and dodge the Boo's. You play as Mario-90 and of course as the title suggests you are against the Koopa Kids, Mario-90 will follow the mouse pointer around the screen once the game is loaded, guide Mario-90 away from the Koopa Kids for as long as possible. An automatic side scroller, so you don't even have to move, you just have to fire using Mario's shotgun at the oncoming enemies by pressing the spacebar!. A cool Mario platformer by Mariofan9, the controls are, Jump (Up Arrow) and backward and forward on the left and right arrows, It's pretty well made and there's a fair few levels, this is one to give a go. Super Mario RPG 2 Role Playing Game, walk around with the arrow keys, AVOID THE FIREBALLS!!! Especially the very first one. Press spacebar throws a fireball at your opponent in battle. The Yoshi's Are harvesting watermelons, and guess whose task it is to help them? Yeah that's right, yours! The controls for this one is just the mouse, click on a melon to collect it, if you miss one its game over! good luck! A very very good RPG Style Mario fan game, controls are the arrow keys only, until you get a fireflower, then the spacebar throws fireballs. This is the first chapter of a huge game thats currently being developed by Mariomeha! I look forward to the sequel. The same controls etc as MGA, the second edition of the Marios Greatest adventure series is by Mariofan9, and is a sequel game rather than a standalone, another great addition to this cool RPG! Oh my god, it's the third instalment of the Greatest Mario Adventure of all time, and believe me the opening battle is a tougher boss than anything I've seen on an official game, his quick, his good at dodging, and his got no problems shooting you, you use the arrow keys to move and the spacebar to fire in this amazing RPG! The "3D" ish style Mario adventure game continues! This will be the fourth in the series, and it is of course sequel to MGA 1-3. 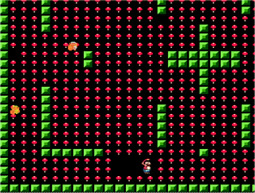 Controls are the arrow keys, and enter fires Yoshi eggs to break through obstacles and attack enemies. Muna must get up through the different levels of platforms and reach the flag before time runs out, the more time you have left when you reach the flag, the higher your total score will be on the highscores list. Controls are the arrow keys. In this game you have to have good reflexes, if a mushroom goes off the screen its game over, so your job is to watch all the five bushes which they could come from and try to grab them using the spacebar and mouse to stop them getting away! SOME PEOPLE ARE OUT TO KILL THE LAST WHACKA! SMACK THE PEOPLE THAT TRY TO KILL WHACKA OR WHACKA WILL BE EXTINCT!! This is a pretty difficult game! Bowser Given a disguise to some of his troops! Jou, Flying Toad, is set to destroy all the disguised enemy's. Use the arrow keys to move. Use Space to Drop a ULTRA bomb. Please don't destroy the real ones! Sam has been transported into his inbox! And he was changed into a star. And that all because an Magic bad post tried to penetrate his inbox! Collect jour good post! Evade the moving magic one! There is a teleporter! USE IT AT YOUR OWN RISK! And o yeah, DON'T TOUCH THE YELLOW BLOCKS! The arrow keys are used to move! The first Fan Game in the section to consist of three smaller ones! Poor old DeBug has to avoid oncoming fighters, and collect coins, Luke has to run from an angry Hammer Brother and GRiM has to fend off lots of different Magikoopas! The most difficult fan game going, Mario and Bowser are invisible, but appear for about 1 second in different places, clicking on Mario gets you one point, clicking on Bowser loses you the game! This is very tough, you play it with just the mouse. Another in the addictive series of mini-games by Mariofan9, in this game you play as Toad, you have to catch as many good vegetables as possible, while avoiding the bad ones (These end the game first time you get one so be careful), the controls are a combination of the up arrow, and the left and right arrows. Choose to play as either Mariomeha or Mariofan9 in there latest game, you have to jump up the side avoiding the spiked enemy which is floating and bouncing around at the top, the controls are the arrow keys. This game looks pretty basic, but is genuinely very addictive! There is a choice of two play modes, free style or high score mode, free style is just to practice the movement, and in high score mode you have to dodge the viruses and collect coins. The highest score wins! Just like one of the Mario Party 5 mini-games, three balls are bouncing around the stone arena, and you play as mario, you have to dodge them for as long as you can, the controls are all four of the arrow keys, the longer you stay alive the more points you get, you start with three lifes. A game with a difference created by Mariomeha, in this game you play as a Koopa Troopa, yep read it right! There are different variations of games such as you have to get the fire flower to baby Bowser. Use the arrow keys as controls. Mario 2004 is a Fan Game made by Mariomeha, You play as Mario and you have a similar skill to what Luigi had in SMB2, you can kinda hover if you use the right moves, the controls are the arrow keys and help is available by pressing Q. You play as Mario in his specially made fruit catching device... thingy... Controls are the arrow keys, collect the fruit to score points, but if you collect a bomb its game over! Harder than it looks, some bombs are concealed behind fruit. This is a new style of game by one of our best submitters, Mariomeha, in this game the level scrolls along quite quick, and you have to jump over all obstacles ahead of you to get points, you cant mess up though you only get one chance! It's spacebar to jump! Masterpiece! I love this game, Just like the SNES version of Super Mario Kart combined with Micro Machines! You use the arrow keys as controls and race around several different circuits from standard track to ice! The aim aim of this game is to drive and keep driving and avoid the hills at all costs, for every second you drive without hitting a hill your score will go up, so avoid those bumps, much harder than it looks. Controls are the arrow keys. This is a pretty unique game in the sense that, yes you are trying to catch items (in this case stars), but this time you have competition, three Lakitu's steal the Stars before they can land! It's harder than it looks. You play as the princess and the controls are the arrow keys. Your job in this game, as cruel as it is, is to play Mario, who stands on a platform (you can go left and right with arrow keys) and throw stones down at the Space Goomba each hit gets you a point, to throw stones use the space bar, don't try this at home. There are two different games in this! in one game you play as a space Goomba and you have to avoid all the big boos in space! the longer you live the more points you get. And the other is a game featuring me (luke) where I have to catch all my mail (hehe made me laugh) and pages, very realistic! Great Game! 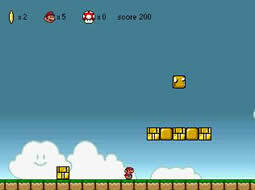 There will be two flying Mario's bouncing around the screen at any one time, clicking on one of them gets you a point. That's all there is too it! Easy huh? Until they start going faster and changing directions yep! A “SUPER MAT GAMES mini game: Mario mouse game” where Mario must watch the mushroom you are controlling carefully as it spins around him eventually making him dizzy, while avoiding various enemies and elements. The mouse is used to control the game. This game is cosmetically just like Super Mario Bros, It's a bit dodgy to control the player, but once you get used to it this is another great addition to the fan games. Play across various levels in this addictive pacman style game - yep we have lots of those, but this is definitely one of the better ones. Controls are the arrow keys. You can choose to play as either the Evil team (Bowser and the Gang) or Mario's Team (Mario, Princess, Luigi etc) - The Controls are the arrow keys, guide your respective team through the themed worlds in this traditional platform style game with a twist. Another of the horizontal and vertical plat formers which we feature so many of here on SMP, non the less though this game is well worth a look and has been nicely customised by the author. Another simple click based game for our younger visitors featuring three classic Mario characters: Mario, Luigi, Toad - all from the SMB era with classic theme tunes in the background. Well it seems to me Mario has been down the gym and changed his eating habits, because he looks to have lost more than a few pounds here... This is a Mario adventure with a difference, Mario has become a stick man! Try to reach the flag at the end of each level without dieing horribly to win! Mario and Sonic battle it out and this time until the death - "Lets keep this clean fellas" - Check out the controls on the text file in the zip, lots of different moves can be used! You play this game just with the mouse, and you play as a gunman trying to take out the Mario's which will run round your desktop or whatever other programs you have open, left clicking Mario will kill him, sounds easy? Mario is quite quick! A classic game of pong, with Yoshi style, by Tom Hall. Well not too difficult, judging by the title, all you have to do is kill Mario, not very nice eh! :) Good luck! In this fast paced racer you must shoot all the oncoming Koopa Troopas in there karts with mushrooms using the spacebar before they crash into you, each time they do your power bar will go down. (Bottom left), You use the arrow keys to turn left/right. Mario is trapped in the great Maze of Subcon, lots of different enemies will block his path on parts of the maze, and there are also lots of different vegetables and powerups you can collect. The game is like Pac Man. 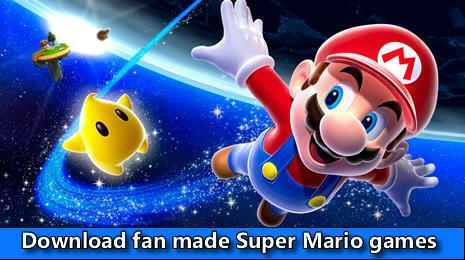 You play as the super Mario (well duh!) and guess what? Princess peach has been kidnapped, but this time, Mario hasn't got his special powers, coz they were stolen by Bowser, so then, Bowser (you remember, that demented turtle thing ma jiggy) whisked Mario away in a whirlwind to a distant kingdom, now Mario has to go through 5 kingdoms, rescuing the toads and discovering the whereabouts of the princess. These are the the rules to the game. Use the arrow keys to move the black Shy Guy in the maze. If you touch the super blocks (walls), you get sent back to the start of the level. The goonies and koopas will also send you to the start of the level when you touch them. Four levels to play! The sequel to Shy Maze, with improved controls, and a little easier in my opinion I prefer this one to the original, guide Shy Guy between the blocks (if you touch the side you go back to the start) and past the bowling goonies and Koopas! Ingame help is also provided! I'm sure you guys have all seen this game before, yep it's Shy Maze, but this time its with a difference, two players can both play at the same time, on the same screen, pretty cool huh, dodge the Bowling Goonies and Koopas, first one to the end wins! To get points, use the mouse to click on the enemies. - The Caged Ghost (blue guy) is worth 1 point. - The Carrobossic (carrot) is worth 5 points. Avoid hitting the Blue Crab -- or else you lose 3 points. To end the game, click on the Angry Sun. Good luck! Using the up and down arrows to move up and down you must use the spacebar to err.. crap on the Goombas, lol.. each one you crap on gets you one point, if a Goomba hits you, you lose! Good luck! This game is 4 mini games in one. These are the rules to game 1. Use the mouse to click on the objects in the room. Each object is worth different points. Soda is worth 2 points. The winged thing is worth 4 points. The Dragon makes you lose 3 points. The tanoobi is also bad. You lose 5 points if you click it. Eldstar is worth 12 points. The crab ends the game when you click on it. Use the arrow keys to move Yoshi. Get as much food as you can without touching a Spiked Goomba. The apples are worth 1 point. The maple supers (Blue mushrooms with syrup on them) are worth 3 points. The Yoshi Cookies are worth 8 points. The shroom steak is worth 15 points. Full documentation in the game! You are Wario, trying to dodge the blocks falling from the sky! Hit ALT when the screen comes up! Controls: Use the arrow keys to move and click space to start the shower of blocks. Dodge as many as you can to get the best score! All is well in the mushroom kingdom until the mysterious disappearance of Mario and the Princess, who's left to investigate? The one and only Luigi. It is his job to find Mario and the Princess. Full instructions are in the zip file. This game looks exactly like Yoshi's Island, yet it isn't, it has been fully remade by a mario fan, and it takes a double click to load and play it! very well made, worth a go, pretty good. The physics of this game actually make it easier than the real Mario games. It's kinda in foreign.. But since when did the classic Mario games have sounds with speech or much text anyway? as long as Mario's foes are splattered beneath his shoes!